How big are the inside cabins on Britannia? The inside cabins range from 137 – 181 feet which is pretty standard. The bed is two single beds which push together to make a queen. It is totally up to you how you have this. On a couple of occasions, I have been cruising with my brother and arrived to find the beds pushed together. If this happens to you, don’t worry! Just let your room steward know and they’ll be happy to change it for you. How many people can fit in the inside cabins on Britannia? The inside cabins can take four adults although I would urge you to think before booking this. It may be the best option but can be very cramped. I have done it in the past but wouldn’t recommend it for a long period of time. The below video was filmed onboard Royal Caribbeans Independence of the Seas and should give you an idea of how 3/4 adults can share a cabin. It is worth noting that P&O will not push the two bottom beds together when there are guests staying above. Not sure why this is the case. Below shows the pullmen beds in the ceiling. Toiletries (shampoo, conditioner and moisturiser). P&O do offer solo inside cabins. These allow solo cruisers to have their own space and it is USUALLY cheaper than paying the dreaded ‘solo supplement’. 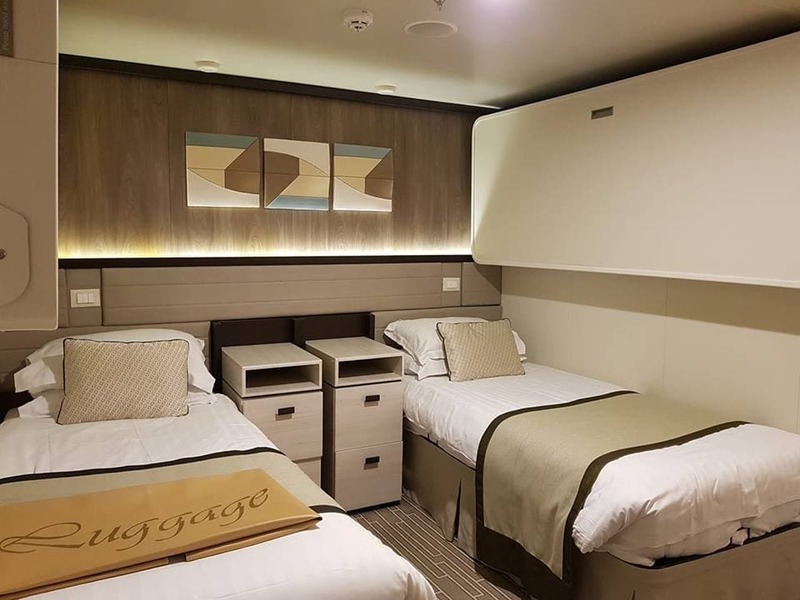 I really like the look of these solo cabins although P&O do not have a solo ‘lounge’ or any other solo space. That said I really don’t think that you would need it. I was amazed by how friendly and polite all the guests onboard were. Everybody chatted and got along, I even made a few friends onboard! The guests onboard were so lovely that I even suggested table sharing in my ‘8 free ‘must do’ activities onboard Britannia‘ post. Table sharing is something that I very rarely do but it was such a positive experience. I am usually an inside cabin cruiser but was lucky enough to have a balcony cabin onboard Britannia. I am so glad that we did. The Norwegian Fjords are stunning and I wouldn’t want to miss a second. We even took our duvets onto the balcony one afternoon to watch the sail aways. Below is me enjoying the cabin with my inflatable Britannia! The styling inside the cabin is exactly the same as the inside cabin. 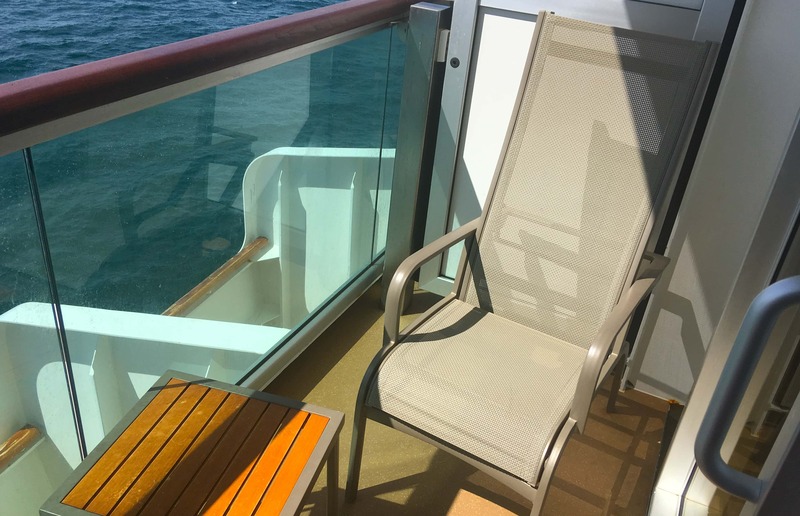 It is worth noting that some balcony cabins have a sofa/couch where as ours just had a chair. How big is the standard balcony on Britannia? The balcony is more than big enough. I’ve heard a lot of people complaining about the size of the balcony but I never had any issues with it. I would say that for one or two people the size is more than adequate. If 3 or 4 people wanted to go on the balcony at the same time it would be a bit of a struggle. Not impossible but you’d have to stand very close together. It’s also worth noting that some balconies are bigger. We had the standard balcony cabin on deck 11, F111. As you can see in this picture the balconies on the deck below were much bigger. We were right at the front of the ship. What is in the Balcony cabins onboard Britannia? My review of the Balcony cabin F111. I liked the cabin and can’t really find anything to fault with it. I particularly liked the separate area by the wardrobes for changing. The bathroom was pretty small, probably one of the smallest I’ve had on a ship but this wasn’t a problem at all. Cruise ship bathrooms are organised so well that everything has it’s place. The shower was actually pretty big and had a door instead of a curtain which I liked. While onboard I filmed a video about all the little things that I loved about Britannia. In the video you’ll see the tea and coffee making facilities plus a little of the cabin. As far as I know, P&O are the only cruise line to have solo balcony cabins. Please let me know in the comments if this is incorrect! 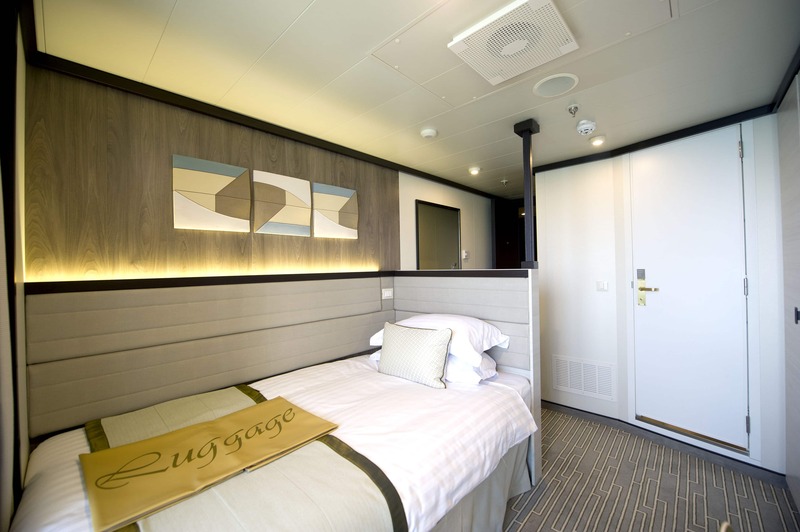 Each cabin has a single bed, the same bathroom as the bigger balconies and a balcony that is also of the same size. The decor is the same as all of the other cabins onboard. The balcony has two seats on it which I like, this means that you can bring a friend back to your cabin. Another option is a super deluxe balcony cabin. These are basically slightly bigger versions of the standard balcony cabin with a few extras. 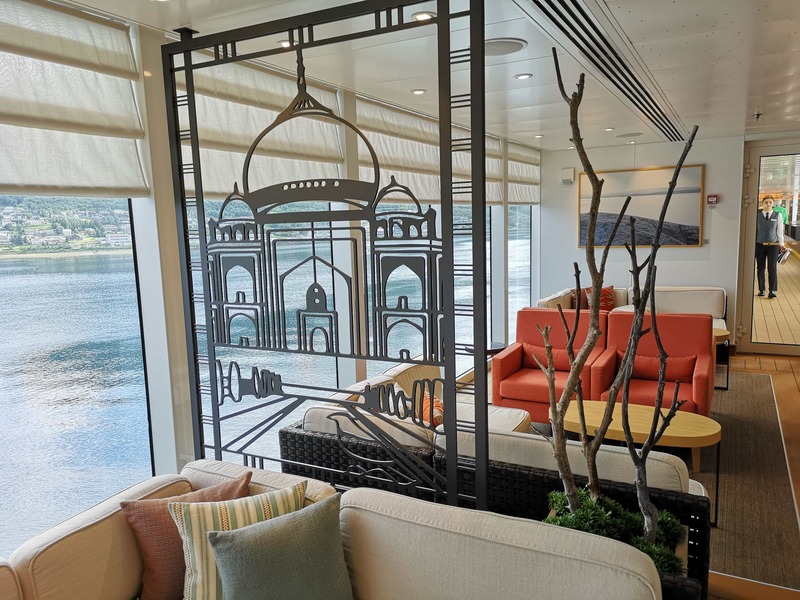 Seating area – Deluxe balconies have a seating area with sofa whereas the standard balcony cabin only has a couple of chairs and a desk. Baths! The deluxe balconies have a bath. This one would be very tempting for me because I LOVE a bath. 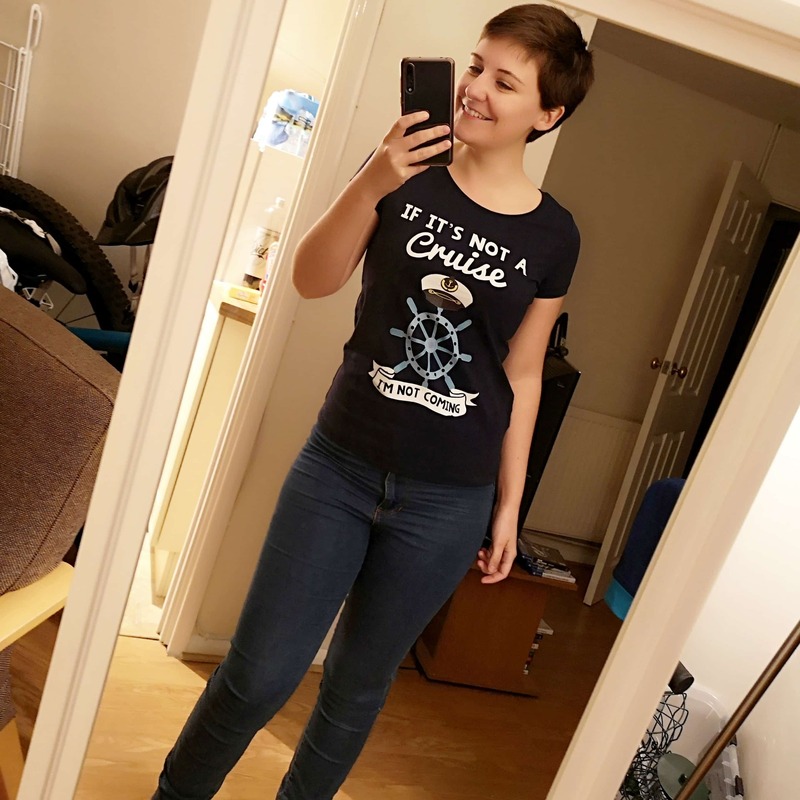 I’ve never had one on a cruise ship though. Video by Tips for Travellers. P&O have 37 accessible cabins which have wider doorways, bigger bathrooms and generally more space. My gran has cruised on Britannia and was really impressed with the size of her accessible cabin. 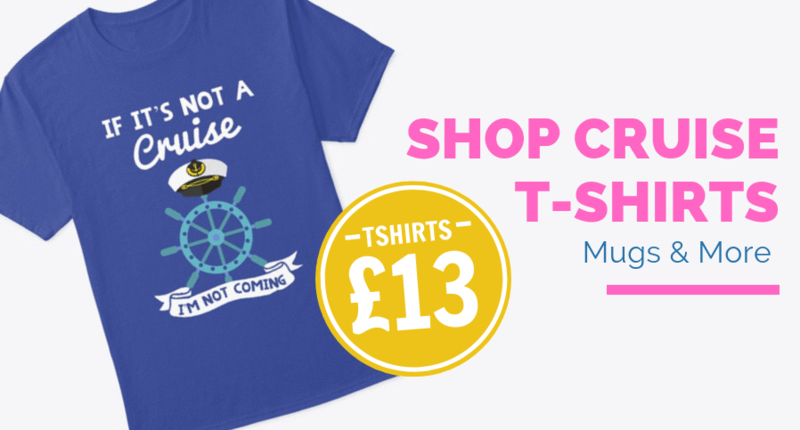 These are available on a first come first serve basis so if you need one make sure you book early. There are a number of suites available onboard Britannia. The ultimate in luxury, our butler-serviced Suites offer the extra space of a lounge area (perfect for entertaining), a superior bathroom, dressing area and a broad balcony so you can take in the sights, or simply soak up the warmth of the sun in complete privacy. Choose to stay in a Suite and you’ll also be treated to some special touches. Britannia doesn’t have any family suites, unlike Azura and Ventura. There are three types of suites. Penthouse, Owners and Premium. The Penthouse suites are the smallest. Owners suites are slightly bigger and then Premium suites are the biggest. What plug sockets are on Britannia? All cabins have UK plug sockets! Woohoo. There is one shaver socket in the bathroom and 5 other sockets in the rest of the cabin. Some UK and some US. Britannia has NO oceanview or porthole cabins. At all! That’s one less option to consider I suppose. Britannia is the sister ship of Royal Princess. The cabins are pretty much the same but just decorated differently. There are 64 suites. 460 inside cabins. 27 solo cabins. 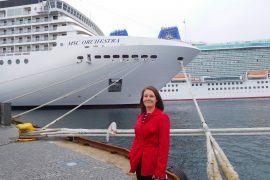 I recently returned from my first ever P&O cruise onboard Britannia. 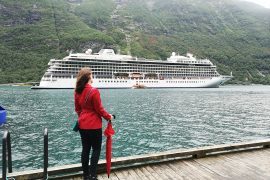 We cruised around the Norwegian Fjords and I was really impressed with P&O. The ship was amazing and I loved the food and service onboard. 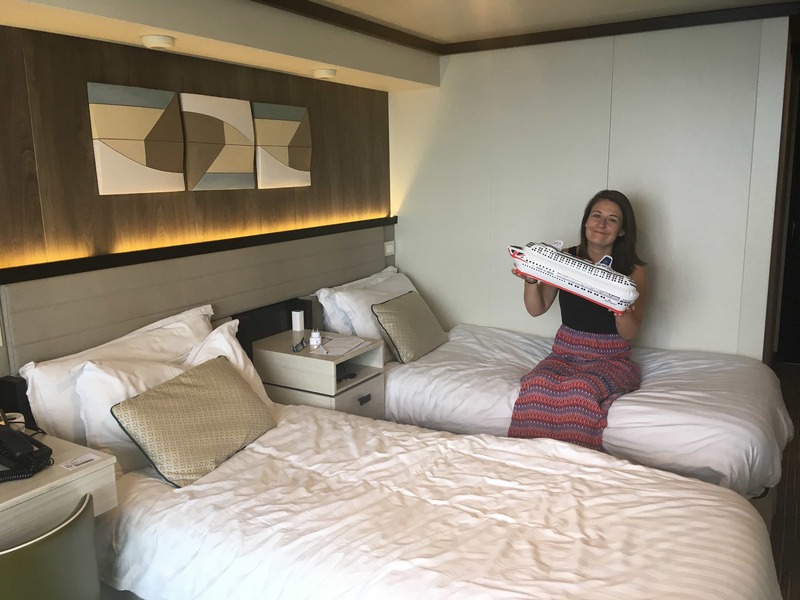 If you are considering a cruise with P&O make sure you check out this post about the 8 free things that I don’t think you should miss when onboard. If you manage to do everything on this list I think you can go home happy! P&O Britannia: 8 ‘must do’ free activities. 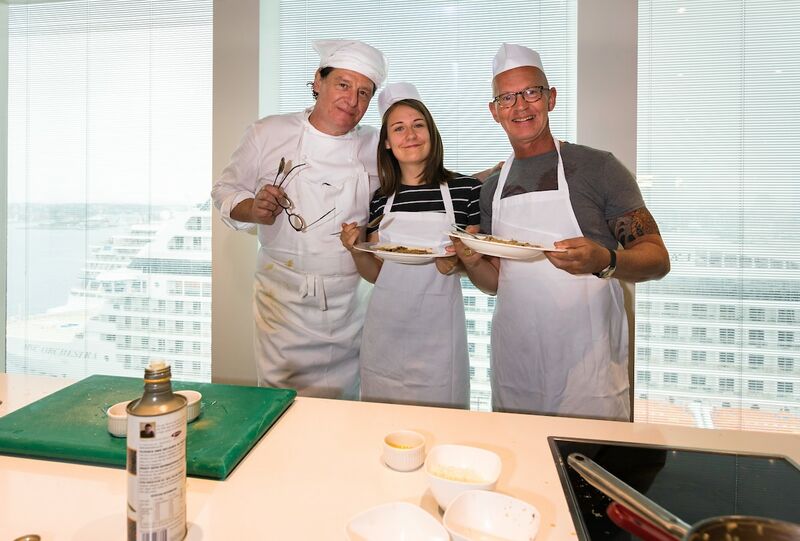 ACCESSIBILITY AT SEA: P&O CRUISES BRITANNIA – THE CRUISING BAKER. 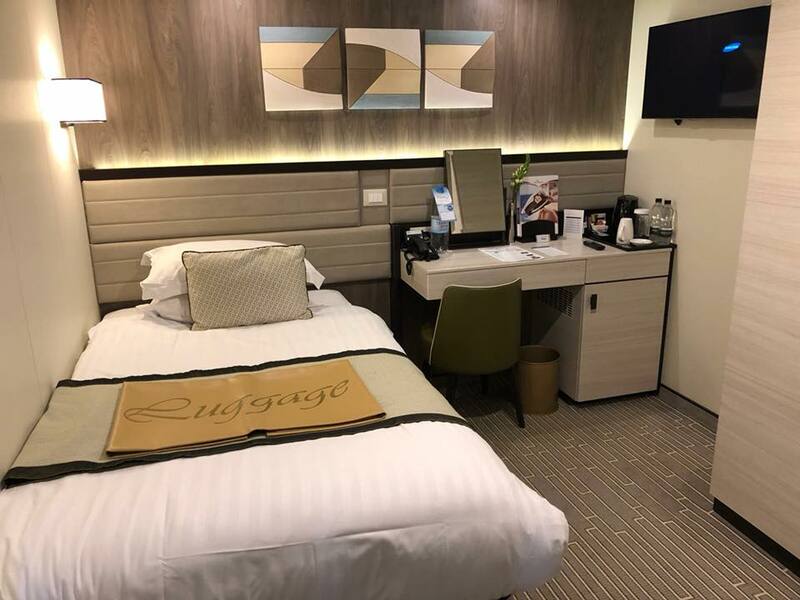 CRUISE SHIP REVIEW: P&O CRUISES, BRITANNIA – THE CRUISE BLOGGER. This is a great post, loved seeing all the differences in the cabins. Britannia looks a fab ship, thanks again for showing us around! Literally just booked a first cruise onboard Britannia heading for the Norwegian Fjords with my son! Luckily came across this blog which is really clear and informative to follow. Can’t wait for next June. Thanks for all the tips and sneaky peaks at what’s on board Britannia! 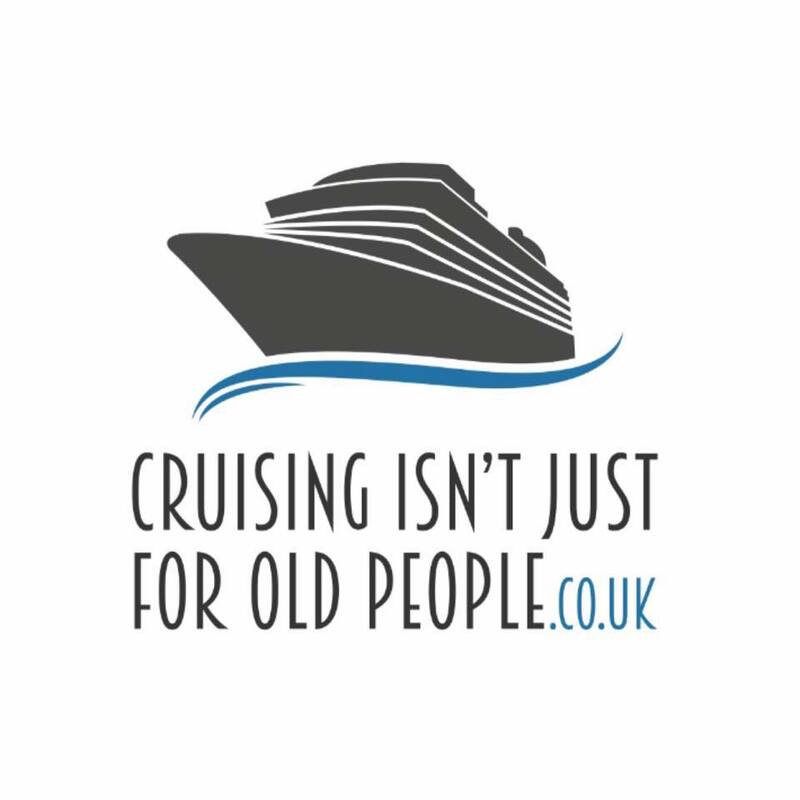 I am enjoying reading through your blogs I am not ‘young’ but I appreciate your reviews and comments and introductions to some cruise lines not as often discussed in North America. You asked about solo balconies – RCL offers something called ‘Super Studio Ocean View with Balcony’. They can sleep two, but are smaller than standard rooms and intended for solo guests.